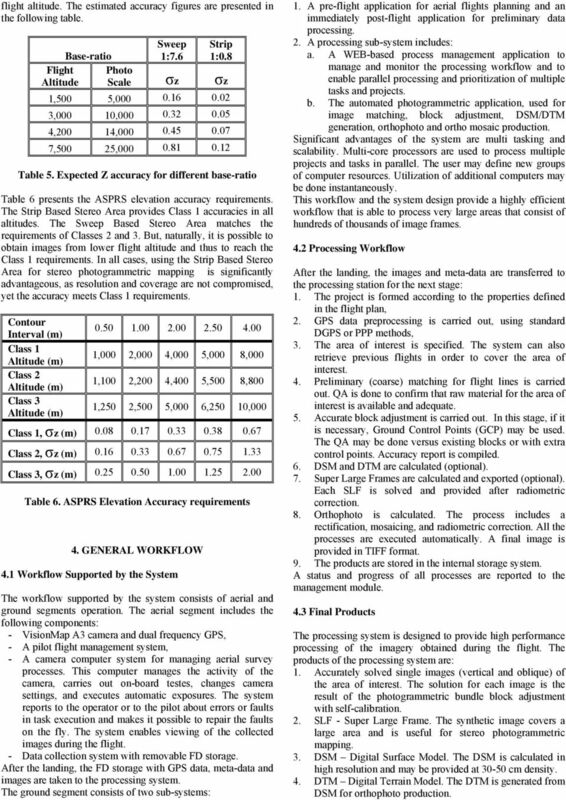 Download "VISIONMAP A3 - SUPER WIDE ANGLE MAPPING SYSTEM BASIC PRINCIPLES AND WORKFLOW"
2 the processes are executed in a fully automated manner. A Typical Operational Scenario is: Flight altitude - 12,000 ft, Time of flight - 4 hours, Area mapped - 2,680 square km, Ground Resolution cm, Number of control points 0, RMS(xy) m, RMS(z) m, RMS(3d) m. Products (automatic outputs) - stereo models, DTM, DSM, color orthophoto. The main characteristics of the system are: - total automation of all processes (from planning the flight to orthophoto creation), - synthetic super large format images for stereo photogrammetric mapping, - high resolution multi-directional vertical and oblique imagery, - the 300mm focal length enables operation at high altitudes (this is crucial in urban areas in order to support true orthophoto generation and because some countries limit the flight altitude over urban areas); - high photogrammetric accuracy and process stability, - a single flight yields both an orthophoto as well as accurately solved oblique and vertical images from multiple directions, - high efficiency for a given resolution, throughput in km 2 per hour is substantially better than with other systems that are operated at lower altitudes, - no preliminary DTM is required, - no ground control points are needed, - no IMU is needed. 2. 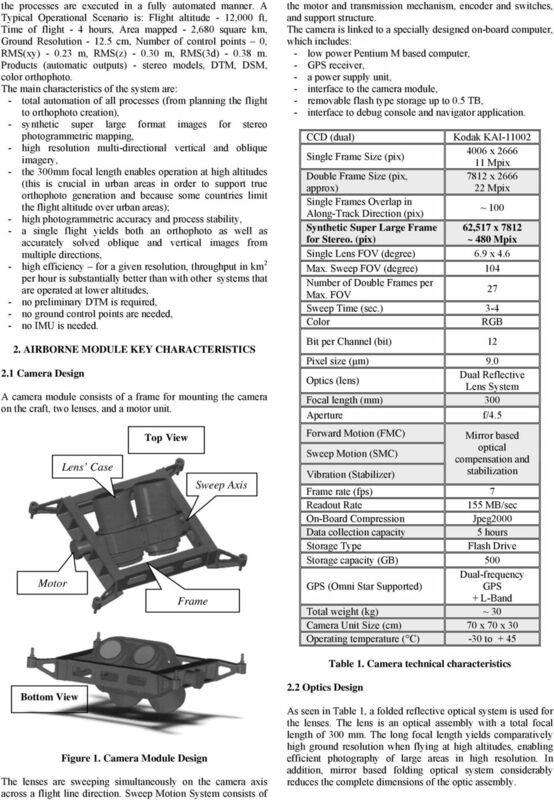 AIRBORNE MODULE KEY CHARACTERISTICS 2.1 Camera Design A camera module consists of a frame for mounting the camera on the craft, two lenses, and a motor unit. Motor Lens Case Top View Frame Sweep Axis the motor and transmission mechanism, encoder and switches, and support structure. The camera is linked to a specially designed on-board computer, which includes: - low power Pentium M based computer, - GPS receiver, - a power supply unit, - interface to the camera module, - removable flash type storage up to 0.5 TB, - interface to debug console and navigator application. CCD (dual) Kodak KAI Single Frame Size (pix) 4006 x Mpix Double Frame Size (pix, approx) 7812 x Mpix Single Frames Overlap in Along-Track Direction (pix) ~ 100 Synthetic Super Large Frame for Stereo. (pix) 62,517 x 7812 ~ 480 Mpix Single Lens FOV (degree) 6.9 x 4.6 Max. Sweep FOV (degree) 104 Number of Double Frames per Max. FOV 27 Sweep Time (sec.) 3-4 Color RGB Bit per Channel (bit) 12 Pixel size (µm) 9.0 Optics (lens) Dual Reflective Lens System Focal length (mm) 300 Aperture f/4.5 Forward Motion (FMC) Sweep Motion (SMC) Vibration (Stabilizer) Mirror based optical compensation and stabilization Frame rate (fps) 7 Readout Rate 155 MB/sec On-Board Compression Jpeg2000 Data collection capacity 5 hours Storage Type Flash Drive Storage capacity (GB) 500 Dual-frequency GPS (Omni Star Supported) GPS + L-Band Total weight (kg) ~ 30 Camera Unit Size (cm) 70 x 70 x 30 Operating temperature ( C) -30 to + 45 Table 1. Camera technical characteristics Bottom View Figure 1. Camera Module Design The lenses are sweeping simultaneously on the camera axis across a flight line direction. Sweep Motion System consists of 2.2 Optics Design As seen in Table 1, a folded reflective optical system is used for the lenses. The lens is an optical assembly with a total focal length of 300 mm. 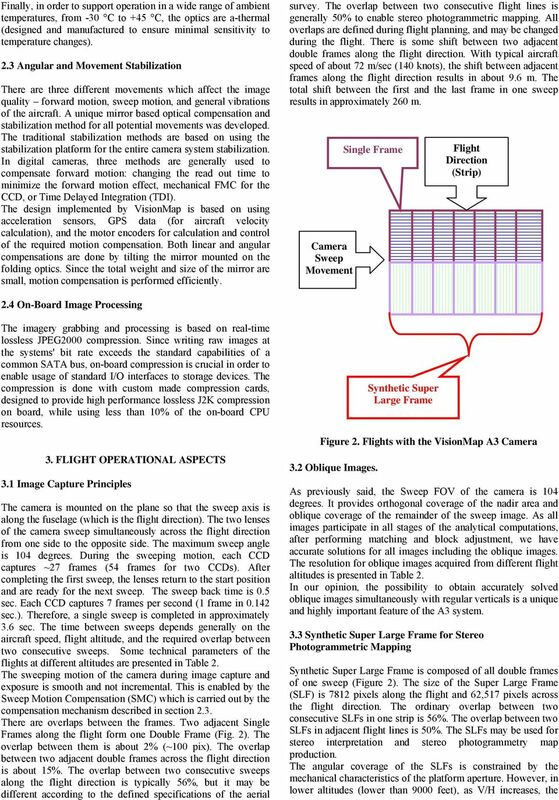 The long focal length yields comparatively high ground resolution when flying at high altitudes, enabling efficient photography of large areas in high resolution. In addition, mirror based folding optical system considerably reduces the complete dimensions of the optic assembly. 5 flight altitude. The estimated accuracy figures are presented in the following table. 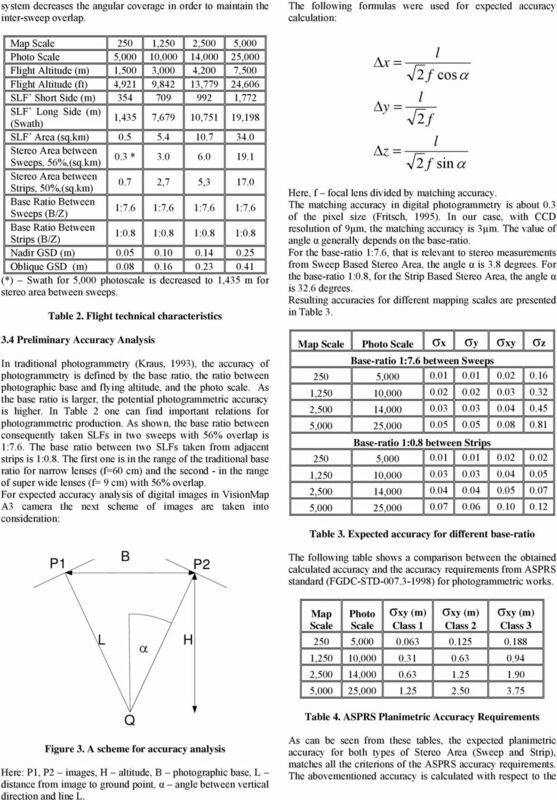 Flight Altitude Base-ratio Sweep 1:7.6 Strip 1:0.8 Photo Scale σz σz 1,500 5, ,000 10, ,200 14, ,500 25, Table 5. 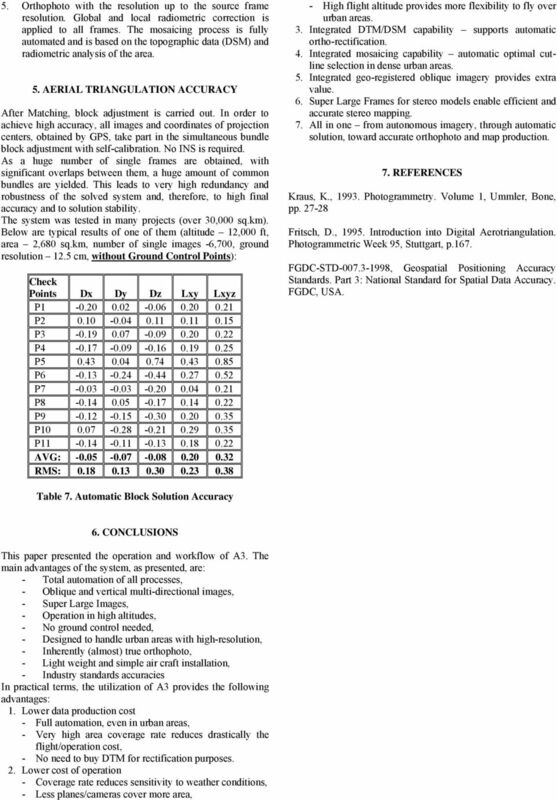 Expected Z accuracy for different base-ratio Table 6 presents the ASPRS elevation accuracy requirements. The Strip Based Stereo Area provides Class 1 accuracies in all altitudes. The Sweep Based Stereo Area matches the requirements of Classes 2 and 3. But, naturally, it is possible to obtain images from lower flight altitude and thus to reach the Class 1 requirements. In all cases, using the Strip Based Stereo Area for stereo photogrammetric mapping is significantly advantageous, as resolution and coverage are not compromised, yet the accuracy meets Class 1 requirements. Contour Interval (m) Class 1 Altitude (m) Class 2 Altitude (m) Class 3 Altitude (m) ,000 2,000 4,000 5,000 8,000 1,100 2,200 4,400 5,500 8,800 1,250 2,500 5,000 6,250 10,000 Class 1, σz (m) Class 2, σz (m) Class 3, σz (m) Table 6. ASPRS Elevation Accuracy requirements 4. GENERAL WORKFLOW 4.1 Workflow Supported by the System The workflow supported by the system consists of aerial and ground segments operation. The aerial segment includes the following components: - VisionMap A3 camera and dual frequency GPS, - A pilot flight management system, - A camera computer system for managing aerial survey processes. This computer manages the activity of the camera, carries out on-board testes, changes camera settings, and executes automatic exposures. The system reports to the operator or to the pilot about errors or faults in task execution and makes it possible to repair the faults on the fly. The system enables viewing of the collected images during the flight. - Data collection system with removable FD storage. After the landing, the FD storage with GPS data, meta-data and images are taken to the processing system. The ground segment consists of two sub-systems: 1. A pre-flight application for aerial flights planning and an immediately post-flight application for preliminary data processing. 2. A processing sub-system includes: a. A WEB-based process management application to manage and monitor the processing workflow and to enable parallel processing and prioritization of multiple tasks and projects. b. 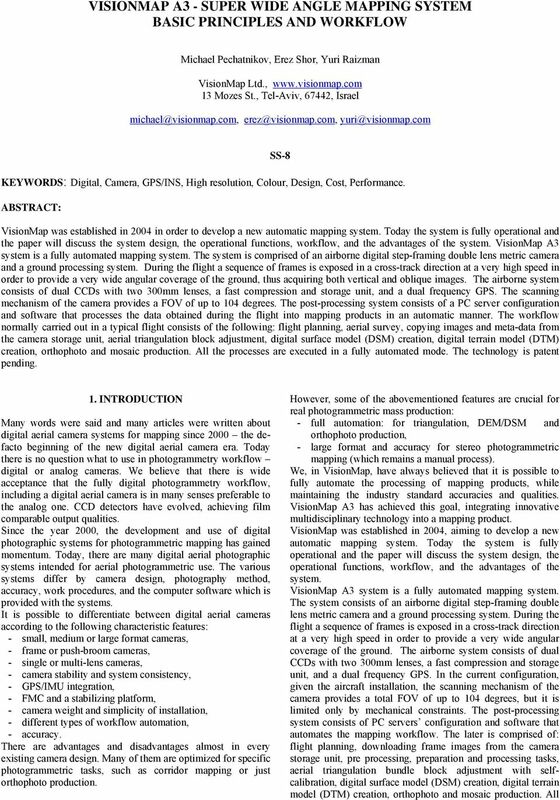 The automated photogrammetric application, used for image matching, block adjustment, DSM/DTM generation, orthophoto and ortho mosaic production. Significant advantages of the system are multi tasking and scalability. Multi-core processors are used to process multiple projects and tasks in parallel. The user may define new groups of computer resources. Utilization of additional computers may be done instantaneously. This workflow and the system design provide a highly efficient workflow that is able to process very large areas that consist of hundreds of thousands of image frames. 4.2 Processing Workflow After the landing, the images and meta-data are transferred to the processing station for the next stage: 1. The project is formed according to the properties defined in the flight plan, 2. GPS data preprocessing is carried out, using standard DGPS or PPP methods, 3. The area of interest is specified. The system can also retrieve previous flights in order to cover the area of interest. 4. Preliminary (coarse) matching for flight lines is carried out. QA is done to confirm that raw material for the area of interest is available and adequate. 5. Accurate block adjustment is carried out. In this stage, if it is necessary, Ground Control Points (GCP) may be used. The QA may be done versus existing blocks or with extra control points. Accuracy report is compiled. 6. DSM and DTM are calculated (optional). 7. Super Large Frames are calculated and exported (optional). Each SLF is solved and provided after radiometric correction. 8. Orthophoto is calculated. The process includes a rectification, mosaicing, and radiometric correction. All the processes are executed automatically. A final image is provided in TIFF format. 9. The products are stored in the internal storage system. A status and progress of all processes are reported to the management module. 4.3 Final Products The processing system is designed to provide high performance processing of the imagery obtained during the flight. The products of the processing system are: 1. Accurately solved single images (vertical and oblique) of the area of interest. The solution for each image is the result of the photogrammetric bundle block adjustment with self-calibration. 2. SLF - Super Large Frame. The synthetic image covers a large area and is useful for stereo photogrammetric mapping. 3. DSM Digital Surface Model. The DSM is calculated in high resolution and may be provided at cm density. 4. DTM Digital Terrain Model. The DTM is generated from DSM for orthophoto production. VisionMap A3 - The New Digital Aerial Survey and Mapping System Michael PECHATNIKOV, Erez SHOR and Yuri RAIZMAN, Israel Keywords: Digital, Camera, GPS/INS, High resolution, Colour, Design, Cost, Performance. From Pixel to Info-Cloud News at Leica Geosystems JACIE Denver, 31 March 2011 Ruedi Wagner Hexagon Geosystems, Geospatial Solutions Division. Vorstellung eines photogrammetrischen Kamerasystems für UAVs mit hochgenauer GNSS/INS Information für standardisierte Verarbeitungsverfahren T. Kraft a, M. Geßner a, H. Meißner a, H. J. Przybilla b, M.
Digital Orthophoto Production In the Desktop Environment 1 By Dr. Roy A. Welch and Thomas R. Jordan Digital orthophotos are proving suitable for a variety of mapping, GIS and environmental monitoring tasks. INTEGRATED GEOPHYSICAL AND REMOTE SENSING STUDIES ON GROTTA GIGANTE SHOW CAVE (TRIESTE ITALY) P. Paganini, A. Pavan, F. Coren, A. EVIDENCE PHOTOGRAPHY TEST SPECIFICATIONS The exam will cover evidence photography involving crime scenes, fire scenes, accident scenes, aircraft incident scenes, surveillances and hazardous materials scenes. Survey Ireland - Winter 1999 High Resolution Space Imagery University of Glasgow High-resolution imagery from space comprises optical imagery with a ground resolution lying within the range of 1 to 5 metres. White paper: How accurate are UAV surveying methods? 760 Veterans Circle, Warminster, PA 18974 215-956-1200. Technical Proposal. Submitted by: ACT/Technico 760 Veterans Circle Warminster, PA 18974. Introduction AUTOMATIC TERRAIN EXTRACTION WITH DENSE POINT MATCHING (EATE) etraining Demonstrates how to automatically extract terrain data using Dense Point Matching (eate) in IMAGINE Photogrammetry.